Starboard aft suite with queen-sized bed. Starboard aft suite with queen-sized bed, spacious sette, and vanity. All guest suites have separate shower and head with spacious sink and vanity. Port aft suite with queen-sized bed. Port aft suite with queen-sized bed, spacious sette, and vanity. A full view of Lolalita from up the mast! Lolalitas spacious galley with two ceiling-to-floor freezers, three refrigerators, and industrial cooking appliances. Chef Megan cant wait to prepare your next gourmet meal! Lolalitas underwater lights, perfect for night swims! Diving on Lolalita is included at no extra charge for certified divers, and we are now including the DiscoverScuba/Resort course for free! Usage of tanks and weights are included at no extra charge. BCD and/or regulator rental is $200 for the week per person for any diver not brining their own gear. -$250 for any referral course, PADI or NAUI. Guests must complete classroom work and pool/confined water skills prior to their week on Lolalita. Gio is a knowledgeable, friendly Captain who finds his fulfilment by connecting people to the sea and enjoying their experiences vicariously through them. Born and raised in London, UK, his career began as a dinghy sailing and windsurfing instructor in the UK, Greece, Bahrain. Next, he moved to Australia to gain a degree in marine biology, conduct underwater acoustic research and guide marine wildlife tours. He then took a job in the offshore oil and gas industry as a marine wildlife observer & spent two years on seismic survey ships all around the world. Eventually he bought his own 50ft sailboat in Florida and used it to lead documentary filmmaking expeditions thousands of miles around the Caribbean, resulting in work published by National Geographic. He is also a surfer, an expert freediver, and a PADI Divemaster. Gio takes great pride in ensuring his guests feel comfortable and safe while guiding them on the adventure of a lifetime. Gio is be joined by Chef/Mate Sarah. 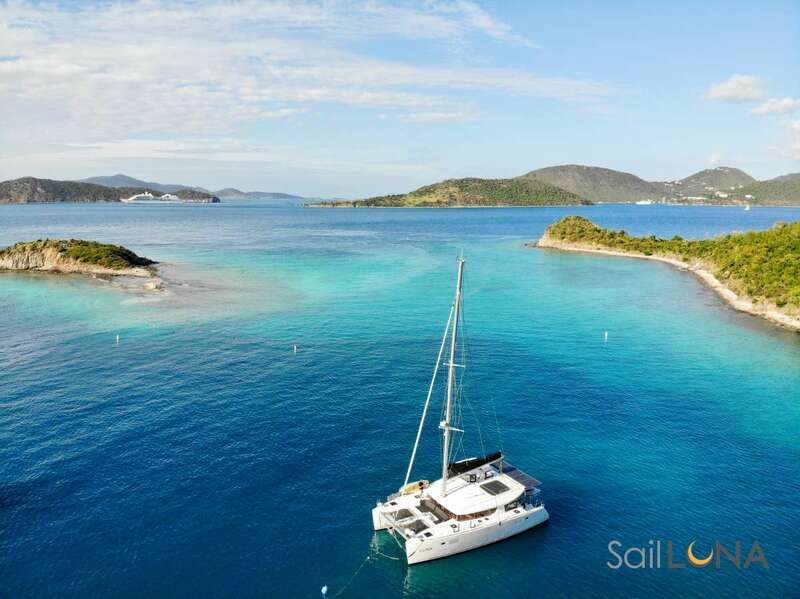 Sarah started yachting 9 years ago for her love of the ocean and travel. She soon discovered her passion for culinary arts and her desire to focus on being in the galley. Working her way up, Sarah was soon cooking for charter guests and on private yachts. Send us an inquiry to get specific pricing for Lolalita. It was truly one of the best vacations I’ve ever had. The crew couldn´t have done anything better. They were very easy to be around, friendly, humorous, and fun to hang around with. All this while doing their jobs with ease and always trying to accommodate us in all areas. We felt like they were part of our ´family´. They made this trip extremely enjoyable. They were very knowledgeable about all aspects of the boat and made us feel very secure. Every meal was top notch, tasty and presentation was always beautiful. The charter was well worth every penny we paid. Never being to BVI, everywhere we went was better than the one before in some way. Loved it all. Capt. Gio knew exactly where to go for good, dives, snorkeling or to just sit back and enjoy the beauty. There was plenty of things for all of us to do. Overall satisfaction was definitely a 10/10 for me. Can´t wait to be able to do it again!! Thanks for all that you did for us! I have CC´d Sue and the girls on this and we look forward to staying in touch with you both. Good luck to you both and we wish you calm seas ahead. I hope our paths cross again soon.